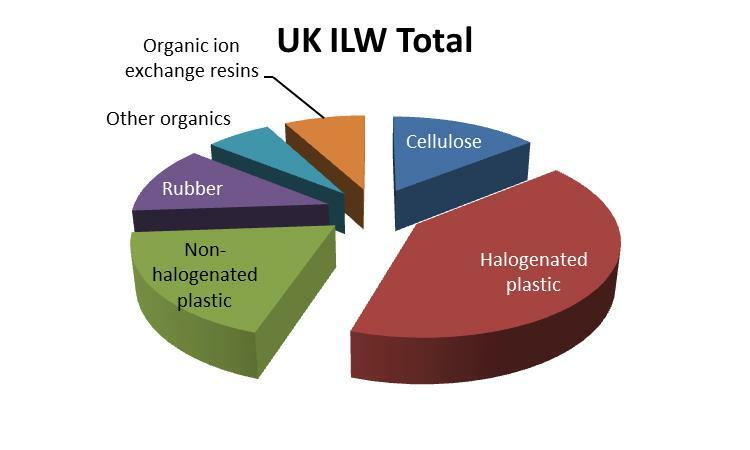 Long-lived intermediate level waste (ILW) requiring geological disposal can include a variety of anthropogenic polymers (including contaminated plastic materials and organic ion exchange materials) and natural (cellulose) organic wastes. In addition, bitumen is used in several European countries as an encapsulant for soluble residues, and ion exchange resins. 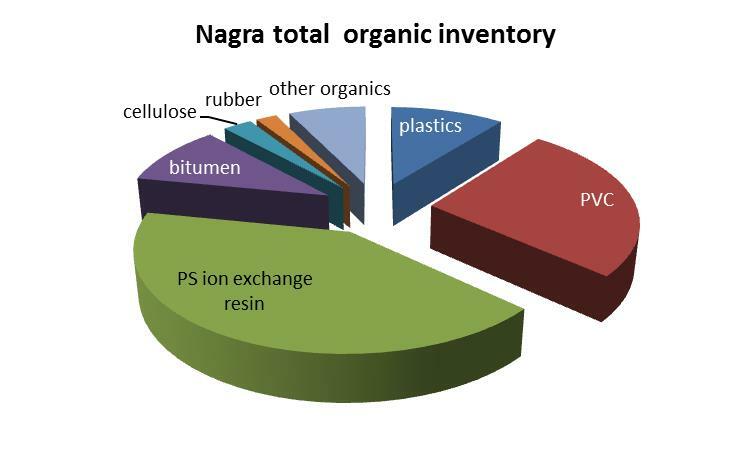 These organic materials provide an energy and carbon source that has the potential to fuel microbiological processes in ILW waste packages and in the repository (Figure 1). Under the anaerobic conditions expected in wastepackages and the repository, such biodegradation processes will involve chemical species, such as NO3–, Fe(III) and SO42- present in ILW, as well as in the repository and host rock formation. These chemical species are oxidized (electron acceptors) and microbial processes may mediate their chemical reduction by reaction with organic compounds (electron donors). Gases such as H2 that will be generated by metal corrosion and radiolysis also act a powerful electron donor that can fuel microbial growth. Microbial processes affecting organic containing ILW are important for a number of remaining key issues for the geological disposal of ILW including the speciation and mobility of radionuclides and the generation and consumption of gases. 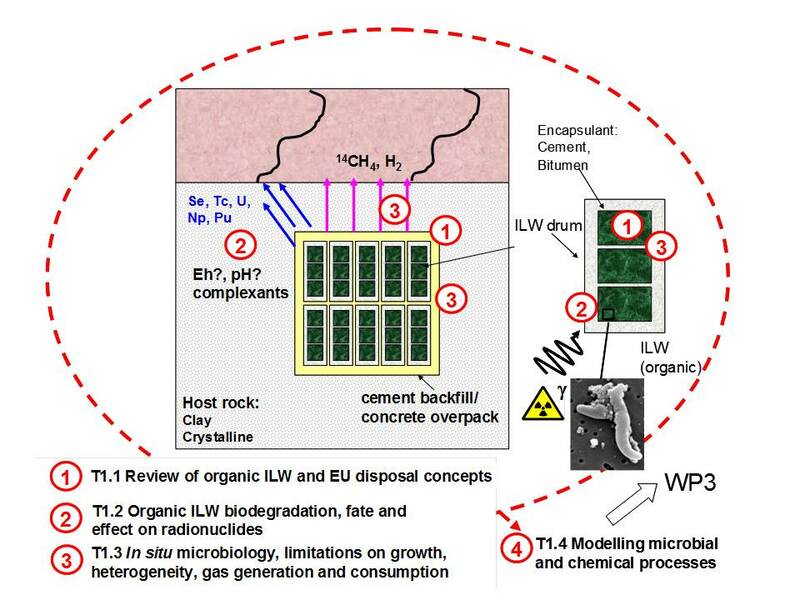 Figure 1 Schematic of key microbiological issues concerning geological disposal of organic containing ILW together with WP1 Tasks 1.1, 1.2, 1.3 1and 1.4. The overall objective of MIND WP1 is to reduce uncertainty of safety-relevant microbial processes controlling radionuclide, chemical and gas release from long-lived intermediate level wastes (ILW) containing organics. This is linked to IGD-TP Strategic Research Agenda, key topic 2 sub topic 2. To quantify the combined rates of biodegradation, radiolysis and hydrolysis of anthropogenic organic polymers and cellulose present in ILW under disposal conditions. To identify key chemical species resulting from organic ILW biodegradation, radiolysis and hydrolysis and their effects on radionuclide speciation and mobility. To establish the in situ chemical and physical conditions that may limit microbial activity in EU repository concepts for ILW utilising cementitious materials within a neutral pH host rock. To examine the microbial generation and consumption of CH4 and H2 under ILW repository conditions. To understand the effect of ILW heterogeneity on bioprocess pathways, pH and redox conditions, barrier degradation and radionuclide release. This review task has been completed during the first six months of the MIND project. Deliverable D1.1 reviews the range of organic materials present in ILW and some low level waste (LLW) requiring geological disposal (e.g. Figure 2) and the chemical and physical conditions that the wastes will be subjected to during storage and disposal. The review also collates current knowledge regarding the chemical and radiolytic degradation of the main materials studied in MIND WP1, namely, ion exchange resins, halogenated plastics (PVC), bitumen and cellulose. The review is of prime importance to the design of experimental work undertaken in Task 1.2. It also provides a basis of Task 1.3 that examines processes under in situ wasteform and repository conditions, modelling and integration in Task 1.4 and wider integration and dissemination through MIND Work Package 3. Figure 2 Example mass distributions of organic materials in ILW from the UK and Switzerland (MIND D1.1). This task examines the combined effects of radiation and biodegradation on a range of organic materials which are present in ILW, or which are used to encapsulate ILW. The experiments examine the interplay between radiation, microbial degradation pathways and abiotic hydrolysis reactions, the latter focusing on alkali (pH 7 to 12.5) conditions representative of cementitious environments. 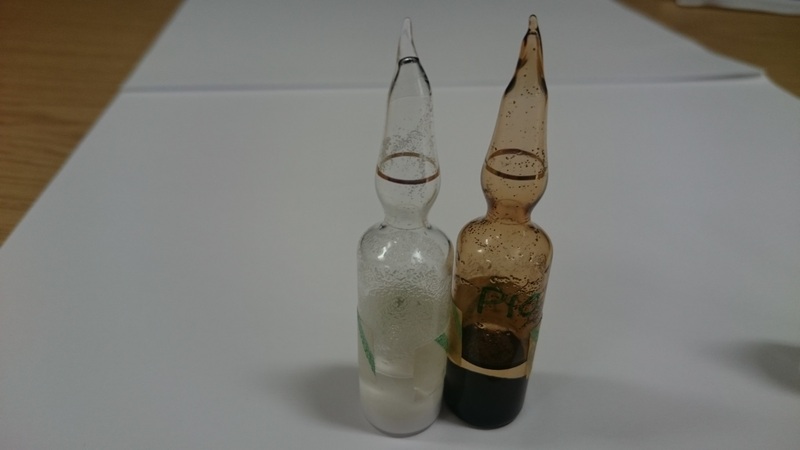 The degradation products will be characterized after irradiation and biodegradation and their complexation properties examined. Of particular interest are cellulose, polyvinyl chloride (PVC, including plasticisers additives), polystyrene (PS) and bitumen, and the bioavailability of their degradation products including isosaccharinic acid (ISA) for cellulose, and the range of fragmentation and hydrolysis products formed from PVC, and PS, and soluble low molecular weight organics released from bitumen. Materials are being irradiated (e.g. Figure 3) at facilities available to MIND partners in Belgium (SCK•CEN, focusing on bitumen) the Czech Republic (RCR, examining ion exchange resins) and the UK (UNIMAN, focusing on PVC). Irradiated and biodegraded samples will be distributed between MIND partners for further microbiological studies (EPFL, focusing on ion exchange resins) and radionuclide complexation studies with aqueous and solid degradation products (HZDR, spectroscopic techniques; UGR, electron microscopy techniques). The biodegradation experiments will be inoculated by various cultures, including consortia adapted to high pH conditions (e.g. Figure 4) and indigenous microbes sampled from underground rock laboratories. Figure 3 PVC materials before (left) and after (right) gamma irradiation at the Dalton Cumbria Facility, UK. 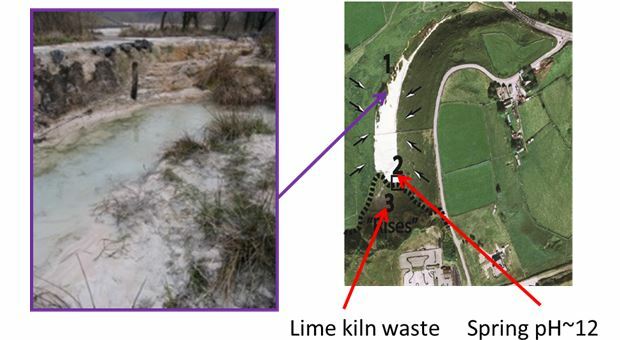 Figure 4 The Harpur Hill former lime kiln site, Derbyshire, UK; a source of alkali tolerant microbes. The rationale of this task is to understand the physical and chemical environmental constraints that may limit microbial processes that can be demonstrated under conditions more favourable for microbial growth, such as in laboratory microcosm experiments (Task 1.2). We will collect chemical data and charatcterise the microbiological processes from TVO’s long-term gas generation experiment (Figure 5) to examine processes leading to methane gas generation and to further understanding of the effects of heterogeneity in wastes within waste packages and the effect of microbiology on pH buffering. VTT will characterise the microbial species involved in biodegradation of the waste materials especially cellulose degradation, which form the major part of the reactive organic wastes in the experiment. Microbial diversities will be characterized from the samples taken from the waste drums and outside the drums and analysed by high throughput sequencing and bioinformatics to obtain a holistic understanding of the microbiology, which can be linked to geochemical and physical measurements and integrated through modelling (Task 1.4). Figure 5 The large scale Gas Generation Experiment (GGE) located at the VLJ repository, Olkiluoto, Finland. Left shows the 16m3 gas tight vessel in its covering and associated online analytical equipment. Right: shows waste drums containing organic and metal wastes and sampling tubes prior to filling the experiment with water. EPFL will investigate the potential for methane gas generation and the associated kinetics of the process under in situ conditions in the Mt Terri URL at neutral pH. 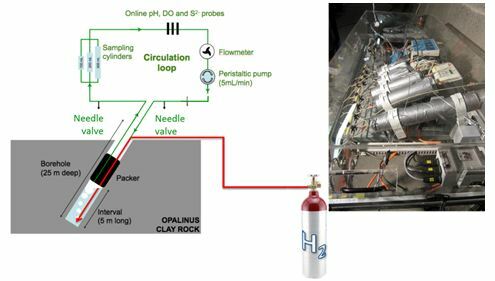 This experiment (Figure 6) will entail injecting H2 and/or organic compounds (from Task 1.2) into a borehole while replacing the porewater with sulphate-free artificial porewater to stimulate methanogenesis. Detailed characterization of the methanogenic microbial community will be carried out using a combined metagenomic and metaproteomic approach. The overall goal of this work is to provide a maximum rate of gas production under in situ conditions and to understanding the mechanism of methane generation and consumption within the microbial community. Figure 6 H2 injection experiment at the Mont Terri underground rock laboratory, Switzerland. This task will represent the biogeochemical processes occurring in the experimental studies (Tasks T1.2 and T1.3) in mechanistic models that will further aid the interpretation and help to synthesise the findings of the MIND WP1 research. NNL will use their GRM code that includes representation of the main anaerobic microbial processes, including microbial gas generation, coupled to advective and diffusive transport and chemical speciation. New modelling tools and approaches will be developed based on GRM in existing commercial and open source software to widen the capability to model microbial processes by end users. Figure 7 Modelling of (left) the volume of methane-rich gas generated by TVO’s GGE (see Figure 5), and (right) the neutralisation of pH that results from microbial degradation of organic wastes.